Over the weekend, I prepped and froze seven slow cooker meals in an hour (including clean-up!). 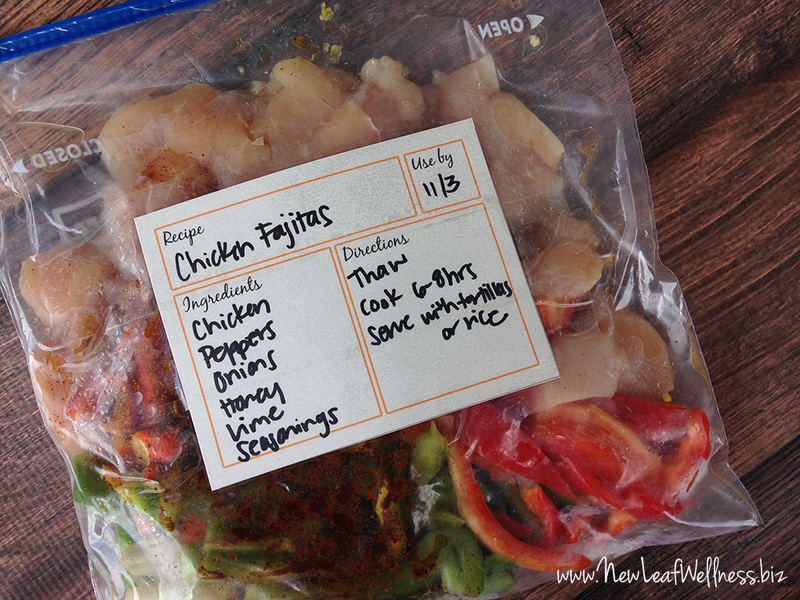 Here’s my grocery list, recipes, and best freezer meal tips! 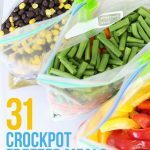 I made freezer meals for years, but took a little hiatus after my third baby was born eight months ago. Most nights I struggle to get dinner on the table, let alone stock my freezer. 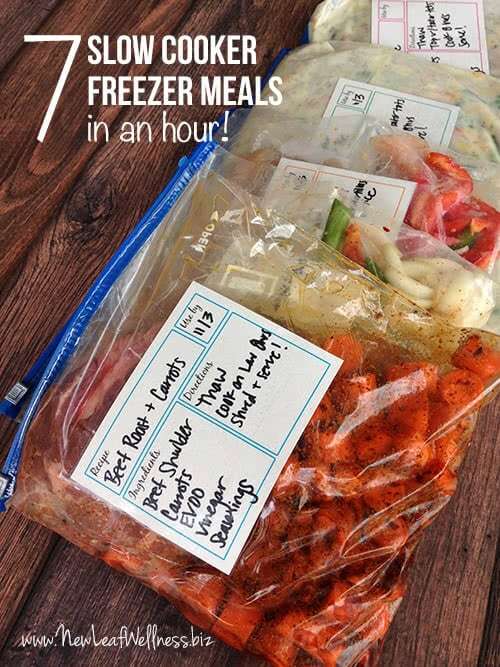 Well, I jumped back into freezer cooking two weeks ago and prepped five meals in an hour. 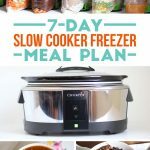 Prepping slow cooker meals was so easy, and saved so much time cooking during the week, that I couldn’t wait to do it again! My baby woke up at 6am on Sunday so I got the two of us dressed and headed straight to the grocery store. By the time we got home, she was ready for a nap and my husband and 3-year-old and 4-year-old were still sleeping so I got to work. I set my kitchen timer for 60 minutes and challenged myself to work quickly. I’m happy to report that I was able to prep all seven meals in an hour, including clean-up! At some point during the hour my 3-year-old and baby woke up and I thought I was a goner, but I helped my 3-year-old get some breakfast, strapped my baby in her ergo carrier, and finished while wearing her on my chest. My kitchen timer went off while I was wiping down my counters. Wahoo! Label all bags with what’s inside and “use by” date. Cook the sauce for the slow cooker pot pie and let it cool while you do the rest of the steps below. Peel, chop, and slice all veggies and add to bags. Add sauces, spices, and everything else to bags in any order, except the meat. 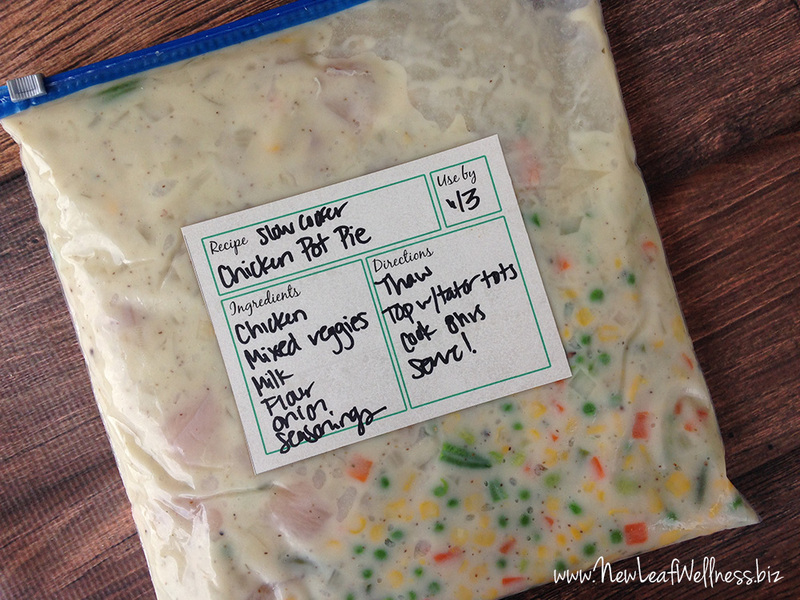 Add sauce to chicken pot pie bags. 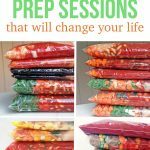 Remove as much air as possible from all of the bags and freeze! 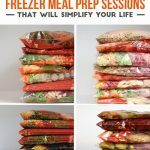 The great thing about freezing these meals raw is that they’re easy to prep and won’t taste like leftovers at all. Now, I can focus on my daughters during the week and not worry about cooking dinner. Yay! Questions? Leave a comment below and I’ll be sure to get back to you. I’m happy to help however I can! Was wondering by freezing veggies with raw meat if there is a chance of contamination or is that eliminated by freezing and cookig? It’s not a problem. Perfectly safe! It’s no more a problem than if you mixed meat and veggies in a stew. Once temps get above 170 for any length of time…any bacteria is going to be cooked into being inert. since everything will be cooked together it’s ok. the problem is mixing raw and cooked. Might be an embarrassing question, but here goes! I just don’t understand how to get meals from the freezer to the table. I thaw them in the refrigerator overnight. They aren’t 100% thawed, but I can break them up to fit in my crockpot. (Otherwise they’re a solid block!) It’s also safer to cook meat after thawing. Hope this helps! I love your freezer labels. Did you purchase those somewhere or make your own? I was wondering where did you get the labels? Have you ever tried using diet Dr Pepper for the pork recipe? Just wondered if the sugar in the regular soda made a difference to how it tastes. I’m not sure. I’ve never tried it. You should never use diet pop or anything with aspartame to cook with as it creates toxic compounds when it is heated.